*Limit 2 pets per site. *Fenced pet area allows pet to be off-leash. Otherwise must be leashed, attended and never left tied to anything. No pens, cages, or kennels permitted outside without prior approval. Can't say enough about this park. We could only stay one night, but we know we're coming back. Only down side: no fenced dog park. This is truly an amazing park. Lots to do on the park and using the shuttle bus, one gets soon near the casino and restraurants. The restrooms are more private bathrooms with shower, toilet and sink in one room. All very clean. Front office desk is very kind. This is a good value for the price. Stayed two nights with 26ft motorhome on 60ft site. Don't question but just stay here! I loved it! The fellow who guided me to my parking spot and helped me back in said Seven Feathers is one of the 5 top RV parks in North America. I won't argue. The showers were a private bathroom cleaned at least 3 times a day probably more. The shuttle will take you to the casino or the truck stop where you get a great juicy hamburger just like we got before franchises. The shuttle will also take you into historic Canyonville. When you call be ready because by the time you put the phone down the shuttle may be there. I'm not kidding, they're fast. The only downside is after a while there's not much to do except the casino. 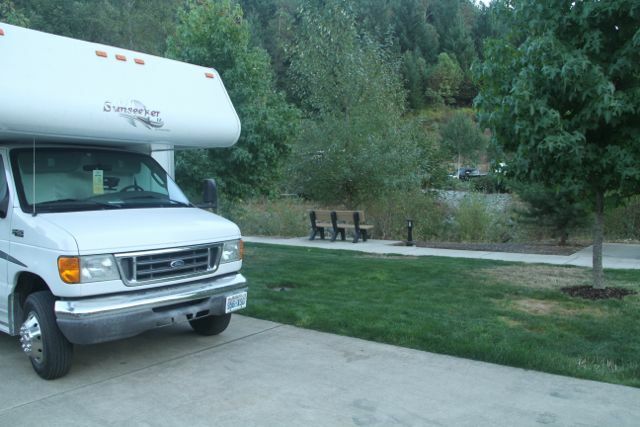 I rate this RV park the best I have ever stayed at, friendly staff, and a free shuttle to the casino! You can park for free in an RV parking lot close to the casino, but for a real treat go for the RV Resort campground. You will be greeted as you approach the reservation office, shown where to park, handed a slip of paper with your license number, a second greeter will open the door for you, and a friendly staff will assign you a site according to your preference. Yet another person will guide you to your site and help you park. 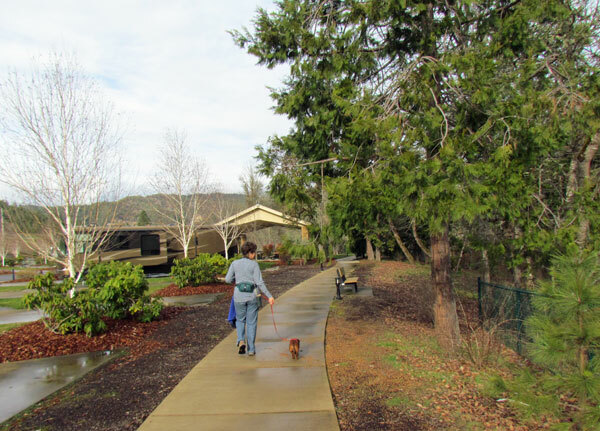 The park is beautifully landscaped with walking paths along a stream. A free shuttle will take you to the casino for dinning or entertainment of your choice. For a first time visit we paid $34. Great camp with lots of amenities. Discount for joining the casino and is retroactive to cover your whole stay. Shuttle takes you anyplace in town not just the casino and very friendly staff. Short walk to the truckstop. Quiet and peaceful with good access road to and from the freeway. Pet friendly campground. I will stay there again. what a wonderful place. New, with lots of space. Friendly staff and a shuttle to the casino!